The Barrio GT90 fly line offers superb presentation, line control and stability in the air. The finely balanced 73 ft head helps us to achieve sweet presentation at pretty much any distance and simply excels with long, smooth casting strokes. Our relatively short belly and front taper produces a line that will load a rod well at short range for off the tip casts, yet our extended rear taper allows huge lengths of line to be aerialised under control for long distance casts. An excellent all rounder, the GT90 will appeal to all anglers that enjoy casting a longbelly style fly line and is equally enjoyable to fish on rivers, lochs and stillwaters. The pale olive colour is excellent for a stealthy approach to wary, selective fish and very subtle in the air with minimal line flash, yet nice and visible on the water to the angler. 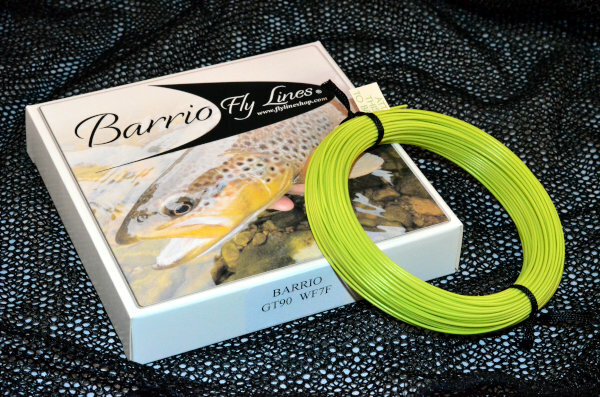 Barrio GT90 weight forward floating fly lines are available in our olive colour from WF3F to WF8F. For a longer and more brightly coloured version of our GT90 line, see the Barrio GT125. Price: £28.80 including free worldwide shipping. Please note that our fly line profile diagrams do not include any information regarding compound tapers ( multiple tapers within a taper ) that we may have included within the profile and that the dimensions may vary for each individual line weight. Used this line for the first time today, it handled straight line nymphing, indicator fishing and dry fly with ease. Very little memory out of the box and even less after a few casts, floats high and casts very nicely. All in all a top class line that does all you need. I am very pleased with the GT90. It is comfortable to cast close and long , the rear taper allows for SHS and longer roll casts and mending as well as a longer carry. I was also surprised how fast Mike had this and the SLX at my door here in the U.S ! Most of my fishing is done with a floating line. Needing a new one I did some research, ending in selecting a 6wt GT90. Before I used it I was impressed with the pea green colour, it just looked stealthy. On the water it is very visible. How can that be? On Loch Lundaidh I cast it for the first time. It was just "right". I'm no casting expert, but sometimes I can get a fair line out. The GT90 flew. Loading the rod quickly and shooting nicely. I don't know how Mike has done it but I think the line hates the reel! Well it tries to get as far away from it as it can! The casting performance wasn't the only thing that impressed me. From the beginning it lay straight on the water. The tip floated and it has continued to perform just like I want a floating line to perform. Now I'm in the process of replacing all my lines with Barrio Lines. It fits my definition of what a floating line should be in every way. Brilliant. Thanks Mike you have added to my angling enjoyment. Just had my new GT90 5 weight out and gave it a swing on my 10ft Greys Steamflex. This without any doubt is the best line I have fished. My previous line was good at distance, but I could not get any good off the tip casts. The GT90 does this perfectly, which makes it a great roll caster as well. But even better it shoots really well and I get a fair bit more distance. Pretty smooth and silent through the rod rings. It strikes well against the wind. It sits straight on the water, hardly any memory. The color is great, quite a natural green, but still very visible. I fished buzzers as well as dry flies. I felt presentation was really good....evidently I took a number of trout to the net. A real pleasure to fish. Fantastic product. Highly recommended. Being new to fly fishing, a friend suggested I try Barrio fly lines. Even as an amateur the difference in cast feel was amazing. I am waiting until the 6 weight is available again before I order a 6 wt rod and reel to compliment my current 8wt. I'll cast with nothing but Barrio. Purchased a #5 GT90 early last season and it instantly became my go to line for light line wild trout fishing. Turn over is excellent, very easy to work with on the water and very forgiving. Supple and responsive, good long range, excellent mid to very short range, presentation on the water also top notch. On lochs it also proved as responsive as i'd hoped, dries and short lining a delight. The olive colour helps it blend in seamlessly with wild surroundings helping make the line amongst the best i've used, most certainly will ensure i've one on my reel for the 2013 season. Barrio fly lines are by far the best, I've been using lots of flylines like expensive or inexpensive ones, but these lines from Mike Barrio are the greatest I've ever used, I own the GT90s in a 3wt and 4wt and also the SLX in a 6wt and 8wt !! So people, just give it a try, it is really worth it. Keep up the good stuff, quality service, quality lines and quality price !! I bought a GT90 from Barrio some weeks ago, spooled it up ready to go and waited for the snow to disappear. Managed to get out for a few hours Trouting last Saturday and to give the new line a go. After a few casts to rid the line of the small amount of memory it had the GT90 performed admirably, easy to cast, good shooting capability and dead straight on the water. I had to grease the tip a little, but in my experience this is normal with any floating line. What I really liked was, with the tapered running line, I could airealise more line if required, without the line "hinging", as is the case with so many WF lines. To sum up, I am so pleased with the line I just ordered two more, a GT90 aftm8 intermediate and a GT90 aftm6 floater. Thoroughly recommended, this makes such a nice change from the usual, "pay £50.00 and get ripped off" attitude of so many manufacturers, the GT90 is only half the price and, in my humble opinion, a far better line. I just purchased a GT90 WF5 and WF8, so impressed I have just taken my 3 wt line off and ordered the WF3. Gorgeous lines in every way and the price is so cheap! I use the GT90, GT125 and SLX lines. I am no casting expert, just an average fly fisherman. I do however know what I like and can say I have always been impressed by the products and service that Mike provides. These lines stand comparison with any other fly lines currently on the market. GT90 #7 - Just bought one of these via a friend who ordered it for me, after hearing about it via word of mouth. Great service ... received the line the day after the order. Fished it yesterday. It casts very nicely, lay very straight on the water even in the cold conditions and I managed 4 fish using small Diawl Bachs and Cormorants. The last metre of the tip started to sink after a while, but this could be the effect of my braided connector and blob of superglue. Overall so far it seems a great value line, which holds its own with lines costing over twice as much. Lets see how long it lasts, but up to now ... great product. This is my first time at Barrio. Well, it's not the last. The GT90 is an amazing line, which I particularly appreciate. Beautiful sliding, pleasant to the touch, supple, and its color! Perfect! I had the opportunity to test most brands of fly lines during my fisherman's career, and although probably will not go elsewhere. I have bought lines at 4 times this price and they did not cast so well. Thank you Mike for the speed of the shipment and see you again soon! The line is really high quality, balances my 6'6" 4 weight cane rod perfectly, doesn't overload the rod even at up to 60', perfect for anything you'd expect a 4 weight to do and MUCH cheaper than any american lines of the same quality. Great service and great product! Bought this line last year and after putting it through its paces in a variety of situations was extremely impressed..... I have just placed an order for a Mallard Sink Tip WF4ST, an SLX WF3F, a GT90 WF3F and a tub of Barrio Line Care. As you can see I like to fish as light as possible and this will enable me to cover any situation with confidence. Well done to Mike on producing these products. Hola Mike, a lo largo de mis años de pescador, he probado varios tipos de linea, pero como la tuya, la GT90 WF4F color oliva... ninguna. Es de lo más suave, no se aprecia memoria, y cae sobre el agua de los más suave. Es una linea con un precio razonable frente a las lineas caras, que puede competir con cualquiera de ellas. Incredible line, loads extremely well in close and maintains stable loop control at distance too. My favorite line I've tried on my 4wt Radian!! What can I say ... I'm simply staggered ... Simply the best line I have ever used and I've been at it for 50 years or so. Cortland, Hardy, Airflo, Rio - you name it and all at least twice the price of yours! The GT90 works brilliantly for traditional boat fishing with a longer slower rod, fitting nicely between a double taper and weight forward ... but with a faster shorter rod (9' 6") it really flies and works for distance casting equally brilliantly - very slick and absolutely no memory. Incredible, thank you and keep up the good work ... think I'll order an intermediate now! I received this line a couple of days ago and I had a chance to test it out Saturday. I was amazed. I bought the line for a 9' 6 wt Scott GS rod. I have never used anything quite like it. Off the tip, 10 foot casts landed softly. At 30 to 40 feet, the loop laid down the fly as if it were alive and just flew down to the surface. But, I kept stripping line off the reel and casting. I finally stopped when I had 70 feet of line outside the tip. Naturally, a lot of that line was shot after making the forward cast, but it was easy and with no greater effort (well, maybe just a little more) than a 30 foot cast. 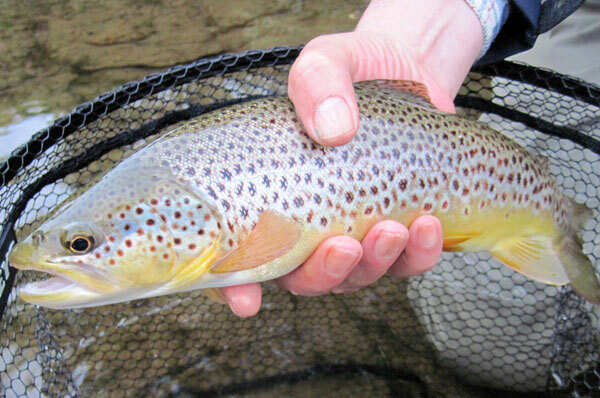 I will have several more before trout season opens again. After a few disappointments from medium priced lines with poor performance, I decided to try one of these in a 5 weight. I was delighted with the behaviour and ease of movement of the GT90 line from the first outing. Line memory was excellent from the first cast, really straight and responsive for casting to where I wanted it to go with soft presentation and for correcting how I wanted it to move through the water. The line Roll Casts well also. I have just bought a Smallstream #4 and will buy a GT90 #6 to replace the more expensive line that I bought at the beginning of this season. I will be Barrio all the way after that, I might even change the line before next season to make sure I'm starting off with the best I've found, top notch lines. Bought this #5 line for my P&M 8.5 ft Splitcane rod. The line performed in conjunction with this rod in one word, terrific. Roll and overhead casts can be executed with short and long belly lengths with ease. All casts where made in one single shot without any double haul to get the fly on the desired spot. Turned over the fly with ease and very accurately as well. Managing the loops between the fingers is a joy on its own ( I am not a line dropper ). Finally, a top class line for a very reasonable price! I received the GT90 WF5F in no time and the line is everything Mike said it would be and then some. I tested it on a river last weekend and the GT90 does a lot of things in a great manner - from presentations in short to long casts. Even though I used a not so fancy rod with some shady hardware (actually a "no name", until I can get something decent) the line shined bright, despite its pale olive colour, which I find ideal for fishing. As a result, I just ordered a second Barrio fly line, the SLX, in 5 wt. floating, but this time in bright orange - I want others to see those loops I'll be throwing shortly. Oh, and I forgot about line memory - wait, there's no memory at all coming from my relatively small reel (O.D. 85 mm), even though a large arbor, the inside diameter is smaller in this Loop Multi 3-6 Light. Thank you for such well designed products! Tight lines and best regards from Bucuresti! Ordered Sunday Evening. Arrived Tuesday AM. Loaded on reel in afternoon and had a practice on the grass out the back door. Five minutes practice saw the tip landing 75’ away in a straight line. I’m far from the worlds best caster, so I’m delighted with the performance of my Agility2 #8 and my new GT90 #8 combo! Also thanks Mike for your super fast service. Now to get it on the water. Very nice taper and subtle line in a good natural colour. Maybe a bit light, for faster rods use +1? But for my 7/8 glass rod (Vision Cult) it is perfect for lighter fishing in a #7. Mike, just a quick note to say thank you. I've now fished my GT90 in all weather conditions from extremes of cold and hot. I've stood on it, caught it in brambles and abused it in all kinds of ways. I've used it most weeks, sometimes twice a week. It has been an absolute joy to cast and still looks great for the next season, very impressed.